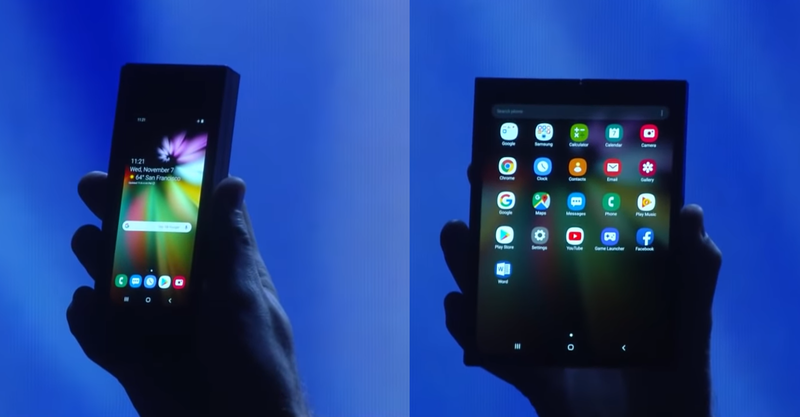 At the Samsung Developer Conference 2018 (SDC 2018), Samsung showed off their first working foldable display smartphone. The actual details about the device itself was kept under wraps but Samsung is calling this display 'Infinity Flex'. Samsung said that this foldable AMOLED display is designed to be folded hundreds of thousands of times and is also making an emulator SDK along with guidelines available for developers for testing their apps. Some of the specifications of the foldable display are also now available. Earlier this week, Samsung teased about its upcoming foldable display on social media. Now, at the Samsung Developer Conference (SDC 2018) currently underway at San Francisco, SVP Mobile Product Marketing Justin Denison took to stage to show off the first working foldable display smartphone. Samsung was careful not to reveal the actual device itself but said that the new Infinity Flex displays are ready to enter mass production in the next few months. Samsung claims that the Infinity Flex display can be folded and unfolded 'hundreds of thousands of times'. This foldable display enables the device to be used as a 4.6-inch smartphone when folded and as a 7.3-inch tablet when unfolded. With Google pledging to offer native support for foldable displays in the Android framework, a seamless screen continuity can be enabled between the folded and unfolded states. Samsung is also introducing a feature called Multi-Active Window that enables up to 3 applications to run simultaneously when the display is unfolded. Denison also stressed that Samsung will be making it easy for developers to start testing their apps for this new form factor. An emulator SDK is now available along with guidelines to help developers make their apps compatible with screen continuity. We expect an influx of foldable smartphones from various OEMs in 2019 but it is ultimately up to developers to ensure that their apps play ball with the new form factor. It is interesting to see that the pixel density of the cover and main displays are the same. Also, the aspect ratio of the folded display comes to 21:9 — much taller than the current 18:9 displays while the aspect ratio of the main display comes to a more standard 4.2:3. Shara also tweeted images of Flipboard's new app that has been designed to take advantage of this form factor. The app, which is being specifically developed for Samsung's Infinity Display takes advantage of app continuity and multi-active windows. Other big-ticket developers are also expected to jump onboard the foldable display bandwagon soon. We are still in the early days of the foldable display future and Samsung itself demonstrated only type of fold. However, the company did note that it is ready to manufacture displays that can be completely rolled up as well. As with any new technology, it will take a few iterations for the product to get perfected, which is only when we might get to see these displays make it to a future Apple product as well. Having said that, expect other OEMs such as LG and a bevy of Chinese OEMs of the likes of Huawei, Lenovo, etc. churn out foldable devices next year.